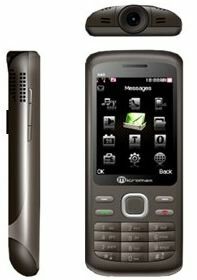 Micromax today announced the launch of the X40 Dual GSM Mobile Phone which comes loaded with an in-built projector and a multi format document reader for Rs.4999. The Micromax X40 comes with a 2.4” QVGA screen, and a resolution of 240×320 pixels.The X40 projector is an adjustable lens which helps you to adjust your viewing screen projection size. You can also mount your phone on the tripod which comes along with the phone, to make sure that you enjoy your favorite movies and give official presentations without any disturbance. The X40 projector phone is a dual SIM phone with GSM support and with features like a 2 mega pixel camera, FM radio, Bluetooth, an internal memory of 80 MB, expandable up to 4GB. The phone also comes with some preloaded applications like Facebook, Nimbuzz, Opera Mini, Snaptu, Mundu radio etc. With the X40, you can now carry work along with you. The phone boasts a multi format document reader for you to read and view multiple formats documents like file on Word, Excel, PDF, Power points etc. It also comes with a multi format video player giving you an ultimate cinematic experience with the projector. is projector phone main projector kitane lumens ka hai or projector ka resolution kitana hai? Micromax bhi chinese hai sab. bakwas phone hote hain iske.